I thought I’d share a little about the supplies I use for urban sketching. My mainstay for the last 3 years (although I have deviated to other sketchbooks) is a cheap, Michael’s sketchbook, with a fake brown leather cover (above). I love it because it has no spiral binding in the middle and I can lay it flat for a bigger spread and it handles watercolor OK. It’s not the greatest paper, but does the job. I also have a new recent smaller book with cream-colored paper from Costa Rica which my aunt bought me (below). I think it is hand-bound, the pages are small and the paper is thin, so I’ve decided to use it more for everyday sketching with pen and light watercolor. It can’t handle much water. I use Koi travel watercolors, a Faber-Castill Pitt Ink pen, mechanical pencil, and a water brush. Sometimes I bring other watercolors in another palette, too. I used to use Prismacolor colored pencils, but have done less of that recently. 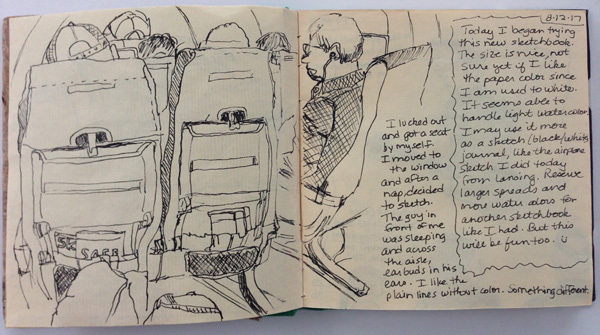 As I traveled home from Michigan a few weeks ago, I started using the smaller sketchbook. I had finished up my first brown sketchbook (after 3 years) and wanted to start anew. I usually use a lot of color, but decided to do a simple ink drawing of the airplane seats in front of me and some passengers. I often journal too, so you may see my musings on the drawings as well. All these supplies can fit into a converted “sketch bag” (old blue purse) or my regular purse. I like that—I can work smaller and take my sketching supplies pretty much anywhere without much fuss. Sketching is so much fun!